Just down the street from your apartment is a little shop you've never entered. Something pulls you in one afternoon, maybe you want a prayer candle, and while you talk with the woman at the counter, you glimpse, behind a curtained doorway, people in white. You hear singing, and laughing, and, is it your imagination, or was that the strangled squawk of a chicken, the furious flapping of wings? The woman behind the counter smiles, and you see, for a moment, that she lives at the center of a lively universe that has nothing at all to do with you. When you step out into the dark street, you feel somehow lighter, freed of the burden of your own importance. 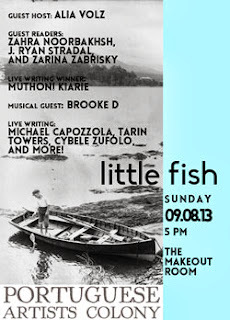 Swim with Portuguese Artists Colony in the wide ocean of experience on Sunday, September 8, at the Make-Out Room. Featuring guest host Alia Volz! Zahra Noorbakhsh is a writer, performer and stand-up comedian. The New Yorker Magazine dubbed her one-woman show, “All Atheists Are Muslim” a highlight of the Int’l NYC Fringe Theater Festival. J. Ryan Stradal is from Minnesota. 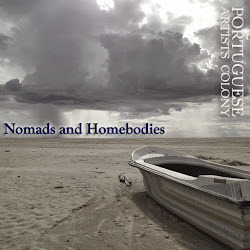 His recent work has appeared in Hobart, The Rumpus, Los Angeles Review of Books, Joyland, Trop, and The California Prose Directory. He likes books, wine, and peas. Zarina Zabrisky is the author of short story collections Iron and A Cute Tombstone and a novel, We, Monsters, a three-time Pushcart Prize nominee and recipient of 2013 Acker Award. PLUS! We'll hear from our last show's live writing winner, Mũthoni Kiarie. The Make-Out Room - New Venue!